20 Compelling Evidences That God Exists: Discover Why Believing in God Makes So Much Sense by Kenneth D. Boa, Robert M. Bowman Jr. Remarkably, even though millions upon millions of us do believe in God, when we are asked why we have such faith, we become tongue-tied and struggle to give a reason for our hope. No wonder those who don’t believe God exists remain unconvinced—there’s too few of us ready to speak on God’s behalf! Ken Boa and Robert Bowman have provided a resource that tackles the most profound arguments from philosophy, science, sociology, psychology, and history … and presents twenty clear, concise, and compelling evidences that show that faith in God—and specifically Jesus Christ—is reasonable. An excellent book and an excellent read. You cannot speed read, as you will find yourself slowing down to catch some things. This is an interesting book covering 20 of the most compelling evidences of God’s existence. An exhaustive investigation of the ancient Shroud of Turin in microscopic detail never before possible. An intriguing trail of crumbs through the Shroud of Turin. And the case for Christ’s Resurrection. Many theories against and many for, in order to be fair to the critics. However, it swings toward the faith in God, due to the evidence! We live in an era where constant change is the norm rather than the exception. Given globalization, increased competition, and constant technological turnover, no organization can run in place: change is not optional. However, the sad fact is that the vast majority of change efforts fail. As authors Gregory P. Shea and Cassie A. Solomon argue, they do not fail for a lack of trying or leadership. Chances are you have led or been part of a failed change. But why did it fail and how can the next change be successfully implemented? In this essential guide, authors Gregory P. Shea and Cassie A. Solomon deal with the real reasons change efforts fail—and how that failure can be avoided. They argue that change—real change—means changes in behavior and that the work environment itself is the greatest obstacle to making behavioral change stick. They reveal a tested method for leading successful change, which they have developed over a combined 50 years of helping organizations do just that. In Leading Successful Change, they share the 2 tenets for making successful change; how to create a scene that will provide a vision of the future; the 8 Levers of Change, a tried-and-true method for designing the work environment to support the changes; and how winning companies—from IKEA to a hospital near you—are successfully implementing change. Change is not optional and it is difficult—but it is also not impossible. Shea and Solomon present a thorough, well-researched explanation of how to make change work. A very compelling and interesting book on leading people toward change. While primarily geared toward the business arena, it can be used & applied personally. One could almost get over their fear, and dare I say disdain, toward change in their lives and in their work place. Reading this book almost makes it an exciting endeavor to take on. Let’s face it, no one likes change. While it is inevitable, it is still one of those things you hate to encounter. But change happens every day, like it or not! Our founding fathers intended religion and morality to be pillars of the new republic, providing the restraint that would allow liberty for the citizenry. Today, this delicate balance of religion and state has been eroded by a secularist push to isolate Christianity in our culture and render it irrelevant. As a people, we either return to our Christian roots… or we divorce God altogether. There really is not much more I can add to this write-up “…we either return to our Christian roots… or we divorce God altogether.” This pretty much sums it up! A fantastic read with great insights in order to take your life, business or personal, to a completely higher level than you ever expected possible! Giving great advice on changing the questions you ask of yourself and of others in order to accept responsibility, or placing responsibility squarely where it belongs! We have all learned to great six questions in order to be exceptionally specific in our lives: WHO? WHAT? WHEN? WHERE? WHY? & HOW? But quite honestly, in order to get to that next level we MUST focus on the questions that stem from WHAT? & HOW? These two are the basis of the greatest questions that we can ask of ourselves to achieve greatness in our lives; which, thereby, will aid us to aid others to shoot for the stars and achieve greatness in their own lives! Like a lot of young women, Tiffany Smiling had been assured that the path to fulfillment looked like the one she’d seen in her favorite movies: She’d be swept away by a soul mate, live in a southern estate, and start a family. But Tiffany’s story unfolded quite differently. Weeks after serving on her high school’s homecoming court, while doctors operated to remove the brain tumor that was killing her, Tiffany suffered a paralyzing stroke. In the nick of a scalpel she lost her beauty and most of her physical ability. Returning to high school in a wheelchair, head half-shaved and face distorted, Tiffany vowed to be normal and live the dream. Read Your Dream. God’s Plan. and see how the Lord wants to use the broken pieces of your life for His greater plan for you. Smiling’s story will help you see the ways God is writing your own amazing story—designed for His glory and your fulfillment. Truly a powerful testimony to the strength that one builds up through the trials and tribulations thrown in one’s path. Though many would throw in the towel, there are those whose faith is actually strengthened by the turmoil that is placed before them. Some even turn to God and listen to what He has to say to them! Tiffany Smiling is one of those people…a special and inspiring person with a tremendous story. If you’re reading this, chances are you know what frustration feels like. You would describe yourself as a person of faith, of trust, and even of ambition. But for all the work and energy you’ve poured into your life, you still find yourself hitting walls. Big brick roadblocks keeping you from the thing you’re meant to do. I’ve been where you are. I’ve hit those same walls, and yet – I know beyond the shadow of a doubt I’m walking in my purpose. Over the last 5 years I’ve published over a dozen books, spoken at churches, universities, and built a vibrant online community for Christians looking to do more with their lives. I’ve been able to accomplish these things because of the information in this book. 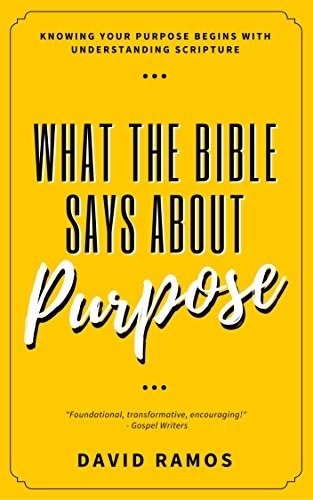 This book holds everything I’ve learned from the Bible about purpose, along with some wisdom from men and women of God who have walked the path of purpose for much longer than I. When you do that, when you begin to accept where you are and who you are as enough, that is when amazing things start to happen. And suddenly all those brick walls crumble into stepping stones. A very good primer for one to use in order to find their purpose in life & in God’s eyes. There is no better place to seek these answers than in the heart of the bible! Well written, quick read, definitely focused with respect to its own purpose! A journalist investigates the toughest objections to Christianity. Despite the compelling historical evidence, many people grapple with serious concerns about faith in God. “If God is love, then what about all the suffering in our world?” “If Jesus is the door to heaven, then what about the millions who have never heard of him?” In The Case for Faith, the second in a series of three DVDs based on Lee Strobel’s books, Strobel turns his tenacious investigative skills to the most persistent emotional objections to belief – the eight “heart” barriers to faith. The Case for Faith, based on Lee Strobel’s Gold Medallion-winning book, is for those who may be feeling attracted to Jesus but who are faced with intellectual barriers standing squarely in their path. For Christians, it will deepen their convictions and give them fresh confidence in discussing Christianity with their most skeptical friends. Another excellent documentary for viewing by all. Well worth the time to watch to deepen one’s faith and to deepen one’s personal knowledge as to “Why?” you believe what you believe! An excellent aid in one’s repertoire of understanding.